Not that we are trying to annoy anyone, but this quote from Oscar Wilde really sums up my philosophy on dealing with rude people. This week's video was heavily requested. We live in a world now where rudeness is more prevalent than we would like and the only way to overcome it is to be extra courteous, polite and kind. To lead by example. So this week I would love to know... how do you deal with rude people? One of the fun things about having Lessons from Madame Chic available in other countries are the different book covers. Here we have the cover for Australia and New Zealand, which will be published by HarperCollins Australia and released on November 6, 2012. I just love its vibrancy. Isn't it fun? I've received a lot of requests over the last few months to address packing for summer trips. My one bit of advice to you is to pack light. You can always buy something you need while away (and that is more fun anyway!). But it is never chic to tote around an excess of luggage (trust me- that's what I did in France). Along with packing a capsule wardrobe scaled for your trip, it is important to mention the art of packing your suitcase. I came across the very subject on Louis Vuitton's website and thought this interactive tutorial was just the best. 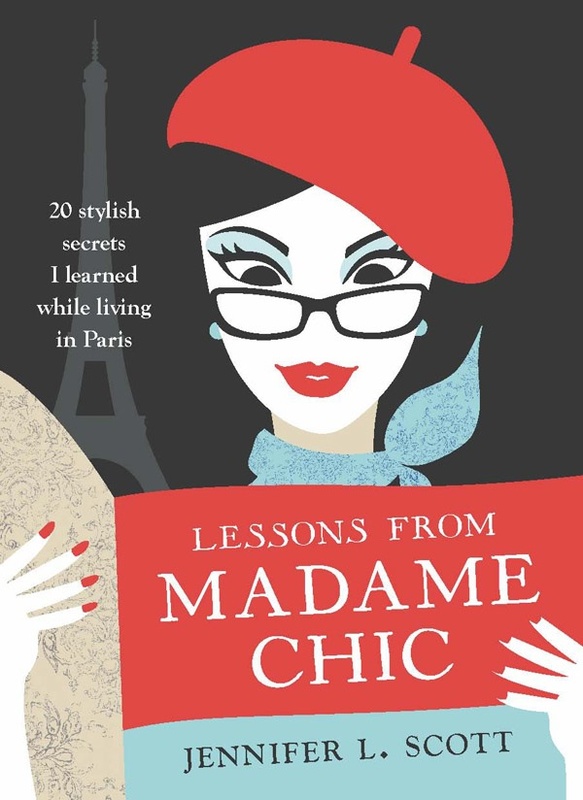 On Monday's post I mentioned the 10 Item Wardrobe collages on Polyvore that are celebrating the upcoming release of Lessons from Madame Chic. Unfortunately the link to the collection of collages was not included. I am including it here. Aren't they fabulous? I am just loving the different interpretations of the 10 Item Wardrobe. On the new site you will be able to easily access news and events related to the book and blog, check out my latest videos and leave guestbook comments. You can also sign up for a seasonal newsletter I will send out to readers. I do hope you enjoy the new design which was created by AuthorBytes. During the summer months I generally like to use a lightweight tinted moisturizer for sheer coverage. It seems to be the easiest solution for my warm weather le no makeup look. In the past I've enjoyed using the Hourglass brand (which I still love) but I've recently decided to look for another tinted moisturizer to add to my arsenal. This all led me to Sephora to do some research. So far I am just loving the Laura Mercier tinted moisturizer (I wear the shade bisque) that so many of you recommended, but I also tried Smashbox BB Cream as well as Amore Pacific. This week I would love to know... what is your favorite tinted moisturizer? After watching the recent Diamond Jubilee celebration that took place in London and (as always) fawning over what the Duchess of Cambridge wore, I became newly inspired to introduce more color to my capsule wardrobe. She just knows how to pull off color beautifully and can wear anything from deep red, to subtle neutrals to bright green. I recently purchased this bright green dress by Amanda Uprichard to inject some vibrant color into my wardrobe. It's a lovely, lightweight silk piece that has a bit of a forgiving silhouette as I am still losing the baby weight. So this week I would love to know... how are you with wearing color? I used to have lovely handwriting when I was in high school. It must have been all of those handwritten papers. But when I went to college the computer became my main mode for writing and has remained so ever since. And yes, as a professional writer I write a lot. Every single day, as a matter of fact, my fingers adroitly cruise along my keyboard. There seems to be little to no need to actually write longhand anymore. So when I find myself needing to do so- when I write letters, for example, I am absolutely horrified by what has become my handwriting. This saddens me. Not only because I would expect a writer to have lovely handwriting, but because I am a daily connoisseur and like so many of you, I like beautiful things- that includes penmanship! So I am on a course to better myself. I came across a really interesting article by Nick Rowlands called, 8 Easy Tips to Improve Your Handwriting, and thought he had a lot of very fascinating, connoisseur-like tips to share. Apart from finding this hilarious, I sadly found it more than an accurate portrayal of how I write! You can’t produce elegant, free-flowing script if you are hunched up over the only corner of your desk not littered with empty coffee cups, half eaten sandwiches, and rogue power cables. Now my desk isn’t that bad, but it’s not exactly a Mecca of orderliness either. As soon as I realized this I de-cluttered my desk immediately. He also states that posture is key as is grip of the pen as well as what type of pen you use. And most importantly, one must practice, practice practice! So I am going on a quest to improve my dire penmanship. De-cluttering, good posture, a relaxed grip and practice. These are all things I can do. I’ll let you know how it goes. In the meantime I would love to know… how is your penmanship? To read Nick Rowland's article 8 Easy Tips to Improve Your Handwriting, click here. Thank you to ItaliaGal for nominating The Daily Connoisseur for the very inspiring blog award. As this week is somewhat of a holiday I will go light on the blogging but wanted to share my follow up video with you that has further thoughts on the concept of jolie laide. I received a great response from last week's post on the subject and had a few requests to discuss it more. Discovering the French concept of jolie laide (ugly pretty) was a really important aspect of stepping into my femininity. It was the moment where I decided to embrace all of my 'imperfections' and learn how to make the best of my features. Also, thank you to blogger Vintage Bel for featuring me in her Glamorous Mum series this week. Click here to see her article. I hope you all have a wonderful week with your families. See you soon!